A lot of people have the wrong idea about Mackerel. Even me. I had only ever eaten it pickled or smoked and it wasn’t my favourite, to put it mildly. I really don’t like pickled or smoked fish. Even smoked salmon, but that is another story. Anyway, I have recently discovered that served fresh, mackerel is absolutely delicious. Mackerel is a strongly flavoured fish, but that is a good thing. It means it can stand up well to other flavours and shine in lots of different dishes. Another reason to eat it? Mackerel is extremely good for you, containing one of the highest levels of heart healthy Omega 3 of any fish. 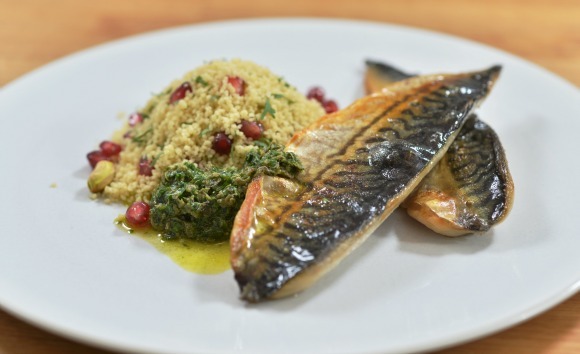 I learned a delicious new way to serve mackerel at the Ecover Eat Clean, Feel Good Masterclass with Rachel Allen. Rachel prepared a parsley, mint and anchovy sauce that set the fish off beautifully. Accompanied by Pomegranate, Lime and Pistachio Couscous this is a meal that makes healthy taste great. Rachel Allen has partnered with Ecover to encourage people to think carefully about the ingredients they use in both their cooking and clean up. Some washing up liquids can leave nasty petrochemical residues on your dishes, but Good Housekeeping Approved Ecover Washing Up Liquid is made using only natural plant based ingredients. You can find out more here on the Ecover website. It is said “The sun should never set on a mackerel once it is caught”. While this extreme may not be possible if you don’t live near the ocean, you really want to eat this fish as fresh as you possibly can. If you have any doubts, frozen mackerel fillets are widely available and may be the safest choice. Be sure to thaw completely before cooking unless directed otherwise on the packaging. As always, be sure any fish you eat is caught sustainably. And don’t be alarmed by the anchovies in the sauce. The thing with anchovies is that contrary to popular belief, they don’t taste fishy. In reality, they simply melt into sauces leaving a lovely salty flavour. Speaking of sauce, this recipe makes extra sauce that will keep well in the fridge. It’s great with lamb or chicken as well as mackerel. Serve with Pomegranate, Lime and Pistachio Couscous. To make the sauce, place the parsley, mint, capers and mustard in a food processor and whiz for 3 to 4 minutes until the herbs are finely chopped. Scrape the sauce out of the food processor into a bowl or jar. Set aside until needed or place in the fridge. (If you plan to store the sauce for more than a few hours cover it with a good layer (about half a centimetre or a quarter inch) of olive oil. It will keep in the fridge for about a month. Heat the oil in a frying pan over high heat. Season the skin side of the mackerel with salt and pepper and place on the pan skin side down. Season the other side and cook for 2 to 4 minutes until the skin is golden and crisp, turn over and cook for a further 1 to 2 minutes. Remove to plates and serve immediately, drizzled with the parsley, mint and anchovy sauce. If you enjoyed this post, you may also enjoy Rachel Allen’s Soda Focaccia. 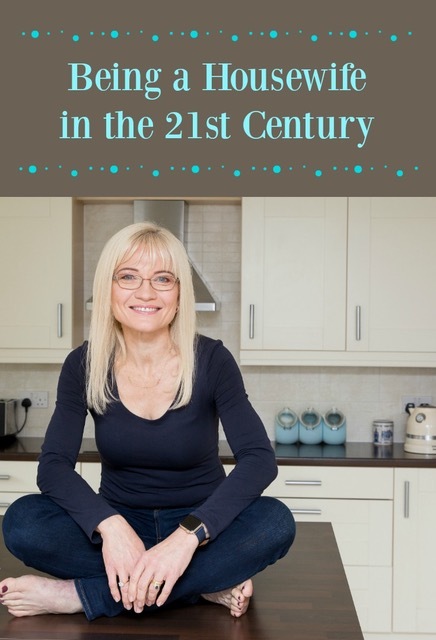 Watch out for more delicious recipes here on The 21st Century Housewife from Rachel Allen and the Eat Clean, Feel Good initiative.